Lynda says, "I printed Gemma's secret crush onto white cardstock and fussy cut her out. I colored her with my Copic markers. I then used foam tape to mount the image onto the card base that was covered with pattern paper from the Dear Lizzy Lucky Charm line. I then added some trim from Michael's. 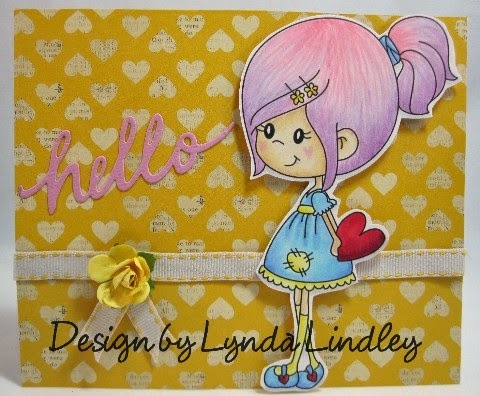 The hello was cut from Die Cut With a View pink cardstock using the Savvy dies "hello" die. I think she'll make the perfect Valentine greeting"! This is such a cute card! I love the colors you chose for her hair, very nice.